Books: So with a lot of time on my hands this weekend, here are the books I read! The Crossover by Kwame Alexander – Ok, I am forgetting the other books for book club next month and using this one instead! Poetry, motion, deeply felt characters, fast moving plot, themes and solid ending. It is all there. I highly recommend it for anyone that wants a fast summer book and over age 11 or 12. It is listed as Young Adult, but should be really be over 6th grade. Healthy Slow Cooker Revolution: I rarely purchase cookbooks. But after getting this one from the library and starting to realize I wanted to make almost everything in it, I decided it would just be easier to buy the book. America’s Test Kitchen shows you how to make GOOD slow cooker meals. 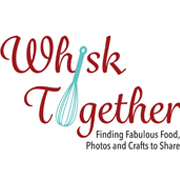 Most of them online are mushy because they instruct you to cook everything way too long. But ATK does it right! I can’t wait! Absolutely Almost by Lisa Graff: I really liked this book! It is slow in the beginning, but it has a great moral and story to tell. The protagonist is a 5th grader who has a genius for a father. Unfortunately, Albie is not as good at numbers and has trouble at school. This book walks him through those troubles. Every child will have some sort of trouble – academic or social – at some point in their life. This book deals with those issues very well and appropriate for any age to read. The Tale of Despereaux by Kate DiCamillo: This book won the Newberry Medal. It depends on who the audience is. A 4 year old might find the “clout to the ear” over and over disturbing. But a middle or high school student would really grasp the themes of light and darkness, hope and despair. The rat named Chiaroscuro is a perfect example of character names with meaning. I recommend this book with its familiar narration similar to Lemony Snicket – but with reservations for younger children. 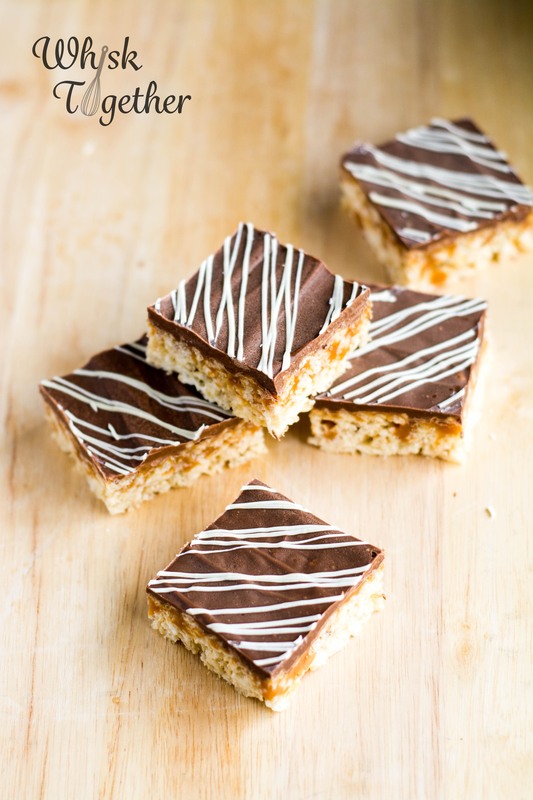 Recipe: I love 100 Grand candy bars. They are delightfully sweet and crunchy and caramelly. So, I tried to make them myself in bar form. After dipping so many homemade Star Crunch Bars, I thought I would try to make these simpler, less time consuming, but just as delicious. 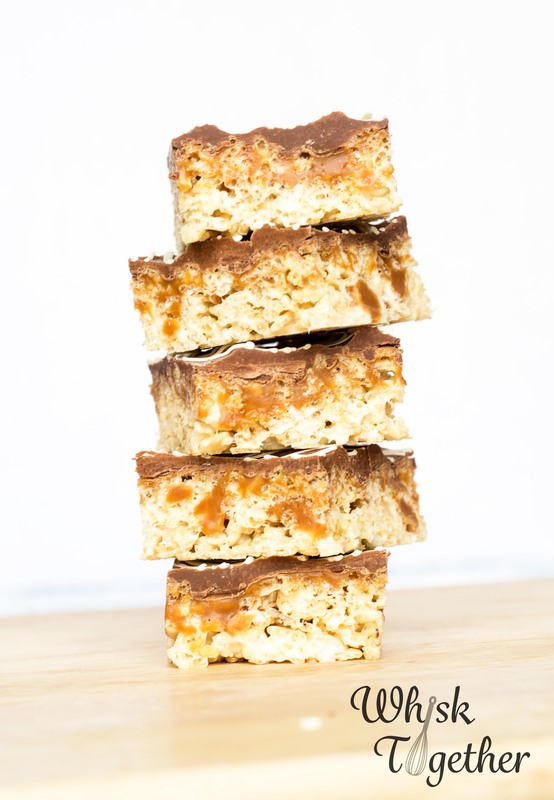 Layers of crunchy rice krispies, milk chocolate, and caramel come together for a fast and fun treat to make. Keep these in a cool casserole carry-all and take them to your next picnic! Ours were gone in less than half an hour. 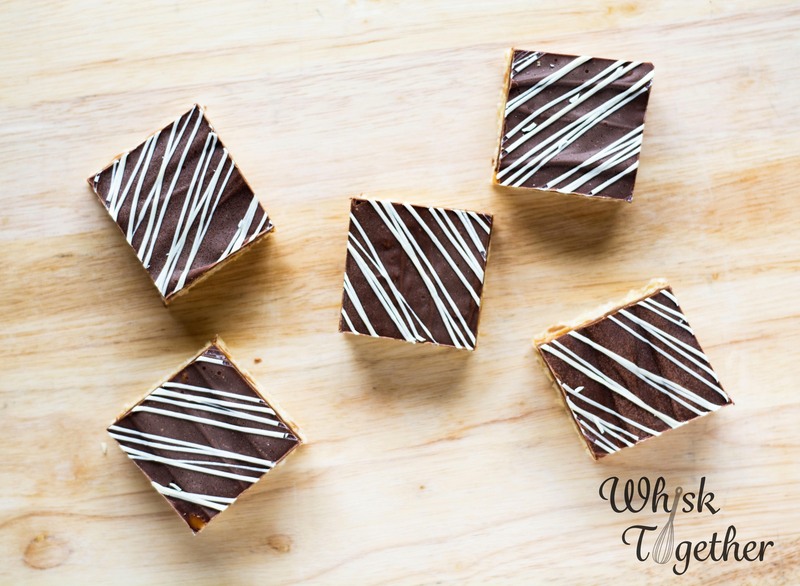 The white chocolate drizzle is not necessary…. just makes them pretty. Sprinkles would be fun, too. Since making these, I’ve come to realize you can make rice krispy treats in the microwave and not have to stand over a stove for 15 minutes! Plus it easier for the kids to make them in the microwave as well. Rub butter all over a 9×13″ pan to coat it or use non stick foil to line it. In a great big microwave safe bowl, melt the butter for 30 seconds. Cover and watch carefully so the butter doesn’t explode. Microwave until melted or almost melted. Toss marshmallows with the butter. Use a spatula to stir them around. Put bowl back into the microwave using 30 second intervals to melt the marshmallows. Once most are melted, keep stirring to melt the rest further. Add crisp rice cereal. Fold in using spatula. Once combined, press the mixture into the prepped 9×13″ pan. This is easier using a little cooking spray on the back of a spatula and pressing that onto the sticky mixture. In another medium sized microwave safe bowl, add the caramel and milk. Microwave for about 2 minutes total – stirring at 30 second intervals – until melted. 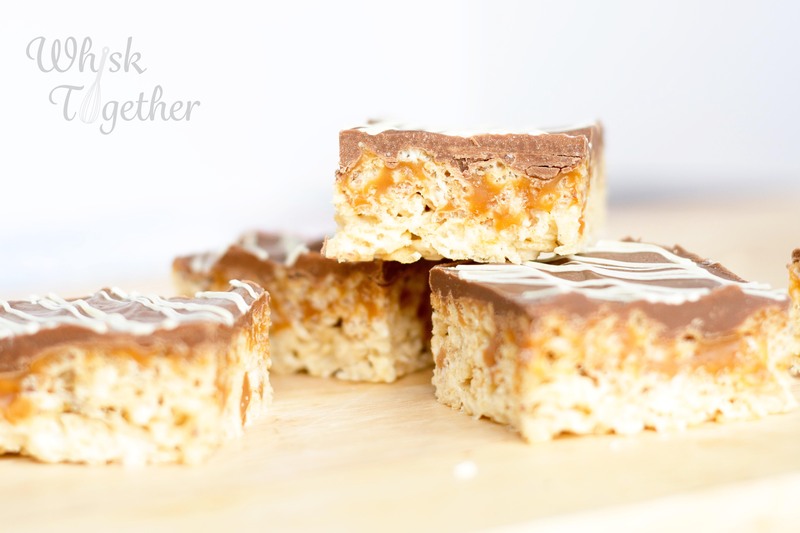 Pour the melted caramel over the rice krispy mixture. Place the milk chocolate chips in the same caramel bowl, or another bowl, and microwave for about 1-2 minutes – stirring every 30 seconds – to melt the chocolate chips. Remember they may burn, so if only a few chips remain simply keep stirring until they are all melted together. Pour the chocolate onto the caramel mixture. Or, I find easier to dollop the chocolate all over and then spread it out with an offset spatula. In a small bowl, melt the white chocolate in the microwave. Pour into a small ziplock bag and cut off one corner. Now drizzle all over the milk chocolate layer. Or sprinkle sprinkles… or peanuts… or whatever would be yummy. Cool in the fridge for about 30 minutes before cutting and serving.